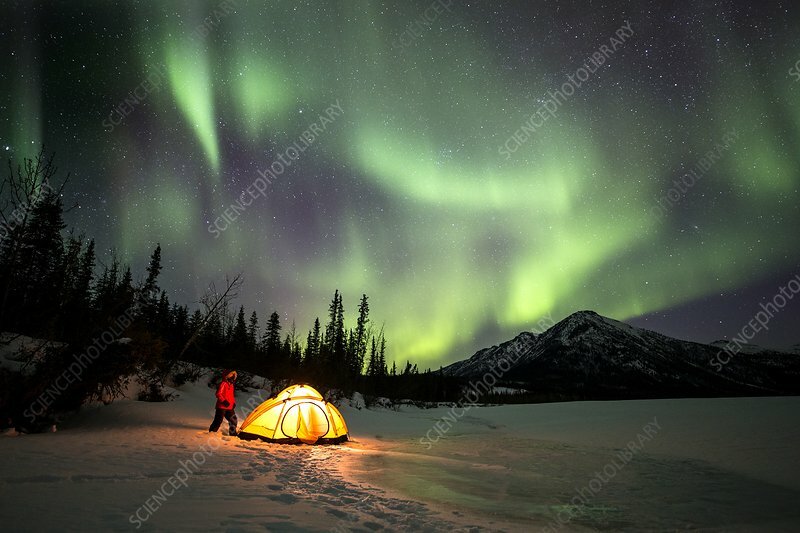 Aurora Borealis illuminates the landscape and a camper setting up a tent by a frozen river in Northern Alaska. This coloured light display (the northern lights) is visible in the night sky at high latitudes. It occurs when charged and energetic particles from the Sun (the solar wind) are drawn by Earth's magnetic field to the polar regions. Hundreds of kilometres up, they collide with gas molecules and atoms, causing them to emit light. Photographed by the Koyukuk River, Northern Alaska, USA.